Hospitals across England are experiencing medicine shortages because of "stockpiling and price pressure as the Brexit deadline approaches", NHS Providers has told BBC Newsnight. 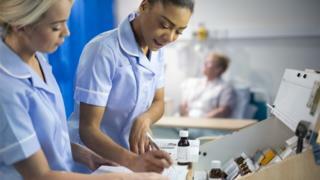 The trade association warned some trusts had seen shortages of up to 160 different drugs in the past six weeks. This was compared with just 25 to 30 drugs in normal times, it said. The Department of Health said there was "no evidence" the "small number of supply issues" were related to Brexit. Mental health drugs and those used to treat rarer conditions are among the drugs reportedly affected by shortages. Saffron Cordery, deputy chief executive of NHS Providers, which represents trusts in England, told Newsnight one trust in England had reported a shortage of 300 different drugs. "Trusts up and down the country are telling us that they have experienced a sharp spike in shortages of drugs in the past month," she said. "We cannot confirm with absolute certainty that it is Brexit but the timing and unprecedented nature of these shortages suggest a correlation with Brexit preparation. "This most probably is the impact of a combination of stockpiling and price pressure as the Brexit deadline approaches. We have not seen a spike like this before." No-deal Brexit: Should patients worry? Ms Cordery's warning follows a meeting this week of leaders from NHS Trusts across England. She said hospital chiefs were reporting shortages of hundreds of different types of medicines, including those used to treat cardiac problems and high blood pressure. The south-west of England and London are particularly affected, according to hospital bosses. It is not thought that any patients have yet been directly affected by the reported shortages - but Ms Cordery warned that further uncertainty over Brexit could have a negative impact on the treatment of some conditions. She said: "Because we are talking about kind of drugs that are needed when someone needs hospital care, it would seem very likely that if these drugs are not available, then this would ultimately have a serious impact on a patient's condition and the quality of care they receive. "Obviously what we think about first and foremost is the impact on patients. "Trusts are getting by at the moment. Whilst we aren't seeing direct impact on patients, if it continues in this way, obviously ultimately will have an impact." Health Secretary Matt Hancock last year advised pharmaceutical companies to stockpile six weeks' worth of medical supplies and urged patients themselves not to stockpile. Mark Dayan, of the Nuffield Trust think tank, said: "Stockpiling might be a plausible mechanism for price rises and therefore shortages. "It is possible to see how we could be getting a foretaste of the impact of [a no-deal Brexit] on medicine supplies now." A Department of Health and Social Care official said: "We have well established procedures to deal with any disruption to the supply chain and our plans to ensure patients can continue to receive the medicines they need, whatever the outcome of negotiations, are well advanced. "All NHS chiefs have been given all necessary information and we are confident that if everyone does what they need to do, the supply of medicines should be uninterrupted in the event of exiting the EU without a deal." You can watch Newsnight on BBC Two weekdays at 22:30 or on iPlayer, subscribe to the programme on YouTube and follow it on Twitter.